To what extent does the assigned factor challenge or support a Canadian national identity? Students evaluate the challenges and opportunities associated with the promotion of Canadian national identity by examining current issues facing the country to determine which factors promote and which factors challenge a Canadian national identity. What current factors in your lives present opportunities that will help you achieve this goal? What current factors in your lives present challenges to your ability to achieve this goal? Arrange for students to share, in a small group, their list of helping and hindering factors. Ask each group to decide on the three most influential supportive factors and the three most influential challenges to achievement of their imagined futures. To structure this task, you may want to use the strategy found in Placemat Activity (Support Material). 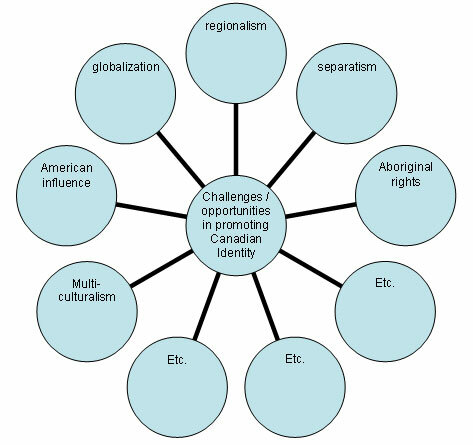 As a class, brainstorm the factors that may either challenge or support a Canadian national identity; e.g., separatism, regionalism, Aboriginal rights, American influence, multiculturalism. Teachers may want to arrange these factors graphically on the board. Provide students with approximately 10–15 contemporary media headlines from newspapers or online news reports. Select headlines that address issues of national identity at federal, provincial and municipal levels and that identify factors such as separatism, regionalism, Aboriginal self-determination and land claims, bilingualism and multiculturalism. Invite students to sort the headlines into groups of factors, e.g., economic disparity, foreign threats, racial tensions, that impact Canadian national identity. Ask students to explain their groupings of the headlines. A sampling of headlines gathered May 26, 2006, is listed below (see References for access to the actual articles). Canada Accepts UNESCO Convention on Diversity of Cultural Expressions. Invite students to make a preliminary assessment of the impact of each of the factors, e.g., separatism, regionalism, Aboriginal self-determination and land claims, American influence, pluralism, on Canadian national identity. Is it a challenge, opportunity or both? Using a chart, such as the one below, ask students, individually, to indicate their answers and explain their thinking. Before beginning, confirm that students understand the difference between a challenge and an opportunity. Arrange for students to share their initial assessments and explanations with several other students. Provide each pair of students with one of the articles that accompany the headlines they have just sorted. Encourage students to look for evidence in their article to indicate whether the main factor is an opportunity, a challenge or both. Invite students to alter their initial assessments, if warranted, and to add to or change their initial explanations. As an extension, ask students to determine where their assigned factor belongs on a continuum from Extreme Challenge to Golden Opportunity for Canadian national identity. Arrange for each pair of students to share their findings, explaining why the assigned factor is an opportunity, a challenge or both. As each pair presents their conclusions, direct them to place themselves in one of three places in the classroom that were designated as an opportunity, a challenge or both. Alternatively, ask each pair to locate themselves on a continuum ranging from Extreme Challenge to Golden Opportunity. To structure and assess this activity, you may want to refer to the detailed instructions and rubric in U-shaped Discussion (Support Material). After the effects of all the factors have been introduced, invite students to think about the implications for Canadian national identity. To what extent does Canada have a national identity? Is it getting stronger or weaker? What are the long-term prospects for a Canadian national identity?